Xiaomi Redmi 6A comes with 5.45-inch (1440 × 720 pixels) HD+ 18:9 display which Produces good colors and viewing angle. It has big bezels on the front. 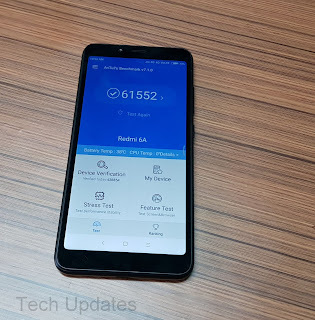 Xiaomi Redmi 6A is powered by 2GHz Quad-Core MediaTek Helio A22 12nm processor It comes with 2GB RAM with 16GB/32GB storage. The performance is good in normal use while playing games Like PUBG, Asphalt 8 there is lag also while multitasking there is slow-down. Overall Redmi 6A performance is better than Honor 7S and Yu Ace which comes MediaTek MT6739 Processor. Xiaomi Redmi 6A is packed with a 3000mAh battery which is able to deliver 7 Hours of Screen on Time. It can last for 15 hours with Dual SIM Data & Heavy use. Xiaomi Redmi 6A has support for Face Unlock, Dual VoLTE, Dedicated MicroSD card. Xiaomi Redmi 6A has 3000mAh Battery which comes with 5V 1A charger it takes almost 3 Hours to charge device fully. Xiaomi Redmi 6A is priced at Rs 5999 for 16GB Storage and Rs 6999 for 32GB Storage.